Not a floor covering and not the subfloor, but what you can’t see – the floor’s underlayment. It is just as important and deserves just as much attention. Underlayment is one of the most important aspects of any flooring project in both residential and commercial settings. Proper selection and installation of underlayments is crucial to the wear and stability of any flooring. Underlayment, or “padding”, as it is often called, is a thin material that rests between the floor covering and the subfloor. Because underlayment is a catch-all term, it can take different forms such as a soft foam or felt, cement board, fiberboard, or plywood. Its purpose is to provide a smooth place for the floor covering to rest, to dampen sound, and, in some cases, to act as a moisture barrier. If installing a floor covering over concrete, a "combination underlayment" such as Eco Ultra Quiet is suggested. For laminate and engineered hardwood, this underlayment has an IIC rating of 73 and a STC rating of 73. Ratings like these vary depending on the type of floor covering that is going to be installed. What does IIC and STC ratings mean? Sound insulation products like underlayments are typically specified for condominiums, hospitals, schools, hotels, office buildings and customers desiring quieter floors. Under the current Sound rating system, the higher the number the better sound suppression quality. In other words; rooms become increasingly quiet as the rating number increases. (IIC) Impact Isolation Class: IIC refers to testing of impact sound energy through a floor/ceiling assembly system. These types of sounds are the equivalent of foot traffic, dropped items, or moving furniture. (STC) Sound Transmission Class: STC refers to testing of airborne sounds through buildings such as a wall or floor system. These types of sounds are the equivalent of voices, music, and television audio. Many residential and commercial properties are now requiring minimums of sound control ratings in the high 50's or low 60's range. 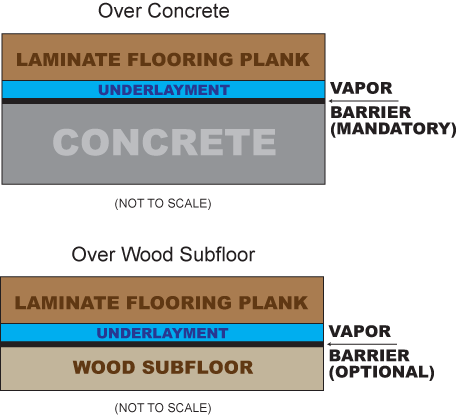 An underlayment, such as Sound Solution with Vapor Bloc, is great for most laminate and hardwood floor covering applications. 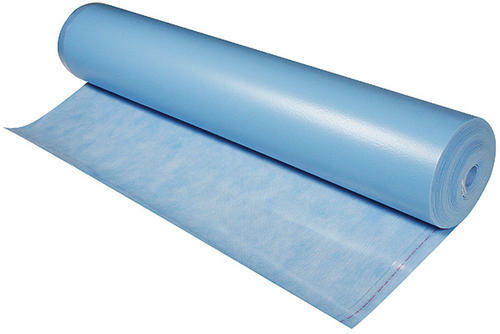 This premium acoustical underlayment has an IIC rating of 73, an STC rating of 67, and a breathable moisture barrier. Is a moisture barrier necessary? When installing hardwood flooring or laminate flooring, you want to protect your investment. Moisture is a big concern for flooring, as in you definitely don’t want it! And not just water spilling or pet accidents. Moisture can come up through your subfloor, especially if you are installing over concrete or below-grade. A moisture barrier is needed to protect the flooring against moisture or moisture vapor. Some underlayments have a built in moisture barrier. 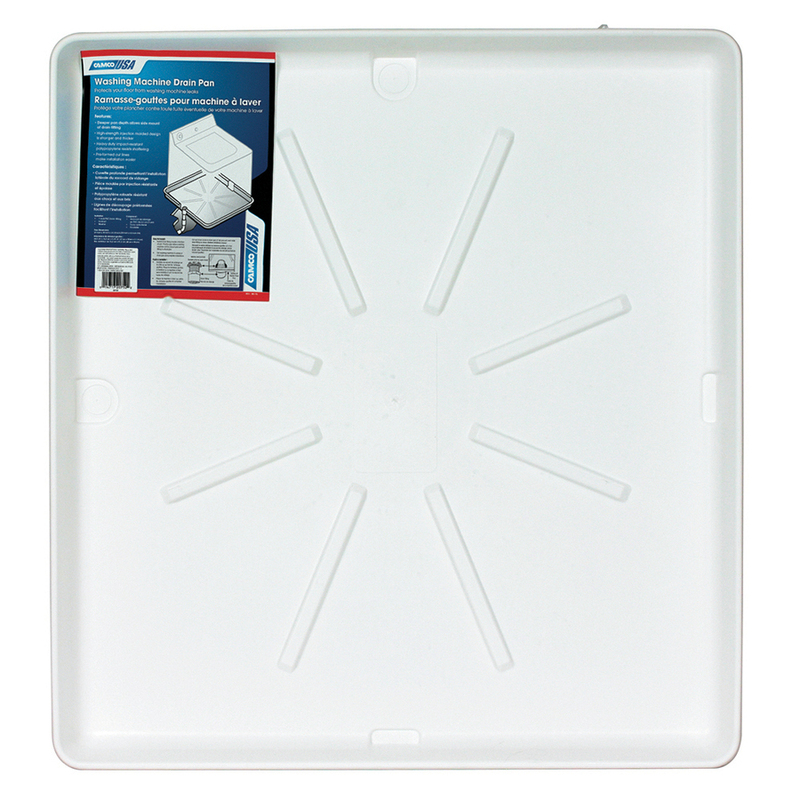 These are typically used for floating floor applications. If you live in a condo, many have HOAs have rules regarding noise levels and often require you to secure an underlayment with high IIC and STC ratings. In this case, installing a laminate floor that already has a pad pre-attached over another underlayment is not recommended. Too much padding can lead to a weakening of the joints, resulting in the floor separating. As you can see, flooring underlayments play an important role in any hardwood flooring or laminate flooring installation project. When searching for an underlayment, make sure you find out what works best for your flooring needs or consult your local flooring professional for information. This will allow you to have the best experience you can and ensure your beautiful new floors last a lifetime! Did you know that there’s a pet in 44% of US homes? That’s a lot of dogs and cats and a lot of long nails tearing at your floors! Add in plenty of shedding and the occasional accident and you soon have good reason to think long and hard about which type of flooring will be the best fit for you and the best flooring for your pets for your home remodel or build. Durable, waterproof, and relatively soft and easy to clean. A must have, top of the list for pets flooring has to be vinyl plank. Vinyl flooring is often referred to as resilient flooring and the simple reason is that it is one of the most durable options available. New vinyl plank flooring is an even better option thanks to its added thickness. Installed properly vinyl will wear well, with no scratches or tears, and with its water resistant qualities is a breeze to clean. Cat and dog hairs are quickly removed with a quick hoover and any accidents are easily removed without leaving a trace. A nice added benefit with vinyl is it’s softness, compared with wood or tile. There’s a lot more give in vinyl which is both more forgiving for our pets and a lot quieter than nails on a hard surface. If it's durability you’re looking for, then avoid cheap products. A thin vinyl floor is the kind of cheap floor you might put down in the kitchen of a rental apartment, but don’t expect it to hold up well. Great for cleaning however, it can be hard and cold for pets. If you’re only interested in your own ease and comfort then ceramic, porcelain, or stone flooring is definitely the best floor for you and your pets. Tile is tough, stain resistant, water resistant, and very easy to clean - making tile the type of flooring can virtually stand up to anything. Cats won’t mind it too much as they can always find a soft chair or bed to curl up on, but dogs can find a tile or stone floor pretty hard and uncomfortable. Cold too - if you go with tile or stone and you have pets, it's recommended to get plenty of rugs put down for a cozy place for your furry pals. If you're looking for durability and longevity, ceramic and porcelain wood-look tile looks great on floors and you get the look of wood with the durability of tile. Softer woods are prone to scratches and is a hard surface for pets. Most homeowners want to know about the best hardwood floors for dogs. If you have your heart set on hardwood floors, then the answer is to install solid or engineered hardwood floors with the highest Janka hardness score. Pre-finished factory produced hardwood flooring typically comes with several layers of tough finish that creates a protective wear layer. Some woods are just naturally harder than others so if you’re looking for the best hardwood floor for dogs, always go for the tougher species. 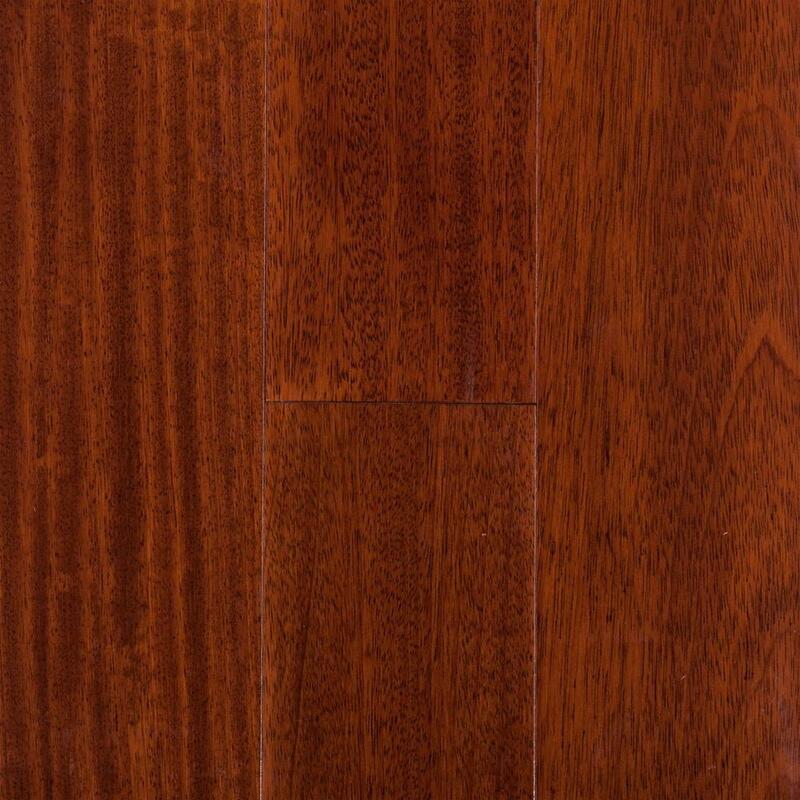 Imported exotic hardwoods like Brazilian Cherry, Walnut, and Acacia, dominate the top end of the hardwood flooring spectrum. When looking at domestic woods, woods like White Oak, Hard Maple and Hickory are all strong choices, but be aware that these hardwoods come at a higher price tag. 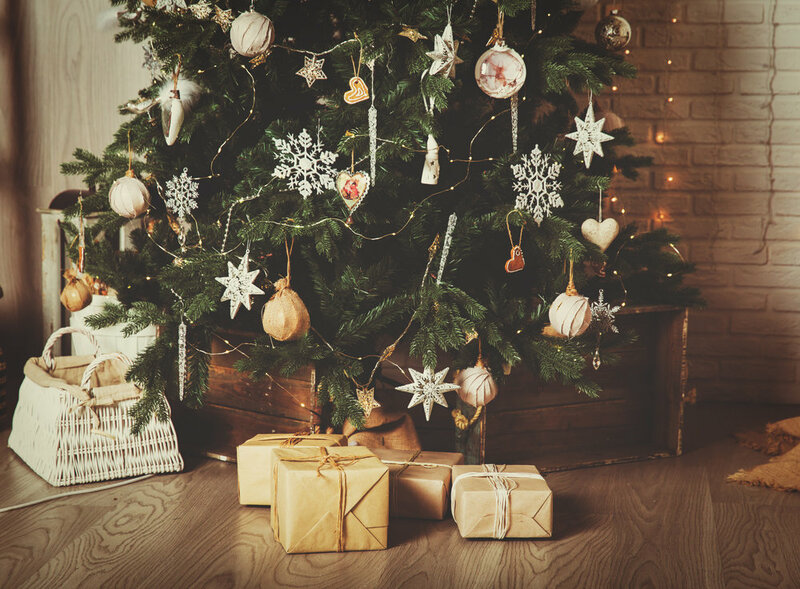 Woods that you would want to steer clear of are woods such as Pine, Fir, Cedar, American Cherry, American Walnut, and light colored Carbonized Bamboo. These woods are softer and will dent and scratch very easily – even without pets. They look beautiful, but they are not very practical, and most are more expensive because fewer people buy them as there is very low supply. Wood floors and liquids do not mix, so pet urine and the dogs water dish are all potential threats to the wood. Dog and cat urine can stain and discolor wood floors and leave bad odors that can be very hard to get rid of if it seeps down the cracks. If liquids are left to stand too long then they can often seep into the wood itself and cause swelling. Durable but loud when it comes to pet paws and claws. While we put vinyl at the top of our list of best floors for pets, many homeowners reach for laminate flooring. Laminate floors are renowned for their incredibly tough wear layer, making them almost scratch proof against claws. This same layer makes the surface of the floor pet stain resistant and like other hard floors, they're easy to keep clean. A new product on the market that is a pet friendly laminate, is Aquaguard laminate flooring which can be found only at your local Floor & Decor. AquaGuard is a water-resistant wood based laminate floor that looks and feels like authentic hardwood. It protects against water for up to 30 hours and is kid and pet friendly with built-in durability and stain resistance while being easy to maintain. Laminate is also a hard surface - which again isn’t conducive to comfort, so be sure to get plenty of rugs or pet beds down if you’re going with laminate. 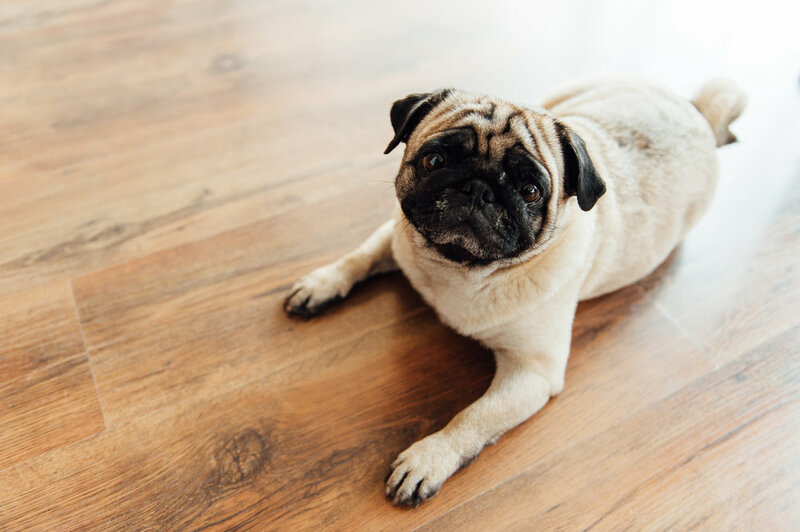 Laminate is known for having a bit of a hollow and louder sound to it compared to other flooring like solid wood or tile, so you can imagine the extra amplification laminate will bring to your dog’s footsteps. 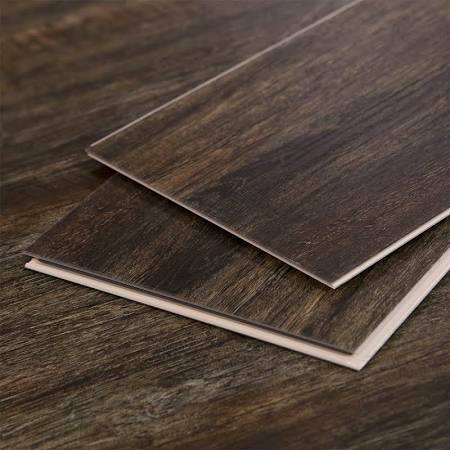 Make sure if you are purchasing laminate, to get a premium underlayment with a sound reduction membrane. Pets love it but you won’t enjoy the cleaning or having to replace it. The best carpet for pets is the one specifically manufactured with pets in mind. Stationmaster is a well-known brand of carpet well suited for the various risks associated with pets. Look for a carpet that is pile cut rather than looped (not Berber), so pets don’t get their claws caught in the threads and run the risk of ruining the carpet. Look for a stain and odor resistant carpet to give you maximum protection against dirt tracked in from outside and any urine accidents.